While he may have studied classical music and been weaned on Gentle Giant, early Genesis, and ELP, Cairo keyboardist Mark Robertson prefers songs over pompous epics. "I get bored with long, prog-for-the-sake-of-being-prog records," he confesses. Listening to Cairo's third and newest album, Time of Legends (Magna Carta), one hears jazz and rock influences that lend accessibility unusual in prog. "Being a keyboard player who likes all these different styles, I thought I would draw from fusion and classical as well as rock and big band arrangements." Since the previous two Cairo albums were intricate affairs, diversified the band's new material, shirking "real fat keyboard sounds" whenever possible. "A lot of the keyboard sounds are plain acoustic guitars or harpsichords," he explains, "not big, fat, lush keyboards." 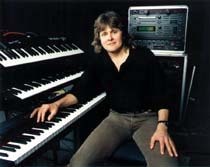 Robertson's main 'boards include a Grotrian 7'6" grand piano, Hammond C-3, Fatar 610, Korg Triton, Minimoog, Yamaha CS-80, E-mu Proteus, and rack-mounted Roland units including three JV-1080s and a JV-990. He also retains his D-50, which has "some pretty awesome tones that I still use for soloing." When it comes to songwriting, the core Cairo trio of Robertson, drummer Jeff Brockman, and vocalist Bret Douglas work out initial ideas that the keyboardist has recorded in instrumental form. In his demos, Robertson leaves spaces for solos and different movements, "almost like a symphonic arrangement," he says. "I look at it in terms of movements like a symphony or a concerto would have. Where there will be vocals, I leave space and I simplify the chord changes to make the lead vocals the focus." Once he has songs outlined, he gives tapes to his bandmates. Robertson and Douglas then work together, with the singer working out lyrics and the duo constructing melody lines. "Right before recording, we rehearse the stuff as a three-piece," Mark says. The diverse Robertson -- whose playing has been praised by Keith Emerson -- remains cognizant of progressive expectations without delving into self-indulgent soloing. For him, songwriting is important. Fans of his playing can seek out his other album appearances, including the new Explorers Club album Raising The Mammoth as well as the Steinway to Heaven solo piano compilation and Magna Carta's Genesis, Yes, and Pink Floyd tribute albums. The keyboardist/composer wants to delve into movie soundtracks in the near future and would love to do a theme song for a future James Bond movie. He certainly has the pedigree to take it on.